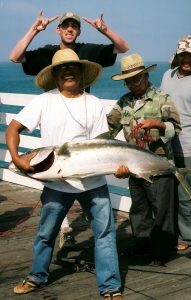 <*}}}}}}}}}>< — Although Crystal is a small pier sitting in fairly shallow water, more yellowtail have been reported from this pier than any other California pier. And, considering that pilings are heavily encrusted with mussels, it’s somewhat amazing the number of LARGE yellowtail that have been landed. 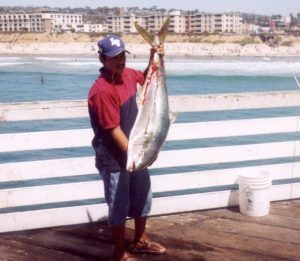 The first report PFIC received of a large yellowtail from the pier was in October 2004 when a 42-pound fish was reported and the picture posted. Members on the PFIC Message Board did not agree with that weight, most guessing 25-30 pounds; all agreed it was still an amazing catch from a pier. Two years later, in September 2006, two more large fish were caught. The first was a 20-pound fish. The second, landed on September 21, was a really large fish caught by Montre Somsukcharean. Initial reports to PFIC simply said a 40+pound yellowtail had been landed at the pier. Later reports, from people who were actually present and witnessed the weighing of the fish, placed the weight at 55 pounds. Peggi Straker, who took the main picture of the catch, said the fight lasted nearly four hours and both the angler and the fish were worn out at the conclusion of the long battle. In September 2008, a new report said mackerel were abundant at the end of the pier and yellows were seen cruising through the mackerel (but none were hooked). Sounds like a lot of cruising going on! Many yellowtail were seen in 2010 and, as already mentioned, eight yellowtail were hooked and lost on a single day (August 27) including some estimated to weigh over 25 pounds. The fish continued to be spotted into October. Finally, in August 2012, two additional large yellowtails were landed, both being tricked into hitting live mackerel as bait. One, caught by “Hallman” weighed 34 pounds. Another, a really large “mossback” yellowtail was caught by Tony Troncale, a PGA golf instructor and avid fisherman. His fish weighed (on two scales) 48.5 pounds. The battle to land the large fish lasted roughly two and a half hours before the fish was landed by the use of a treble-hook gaff. 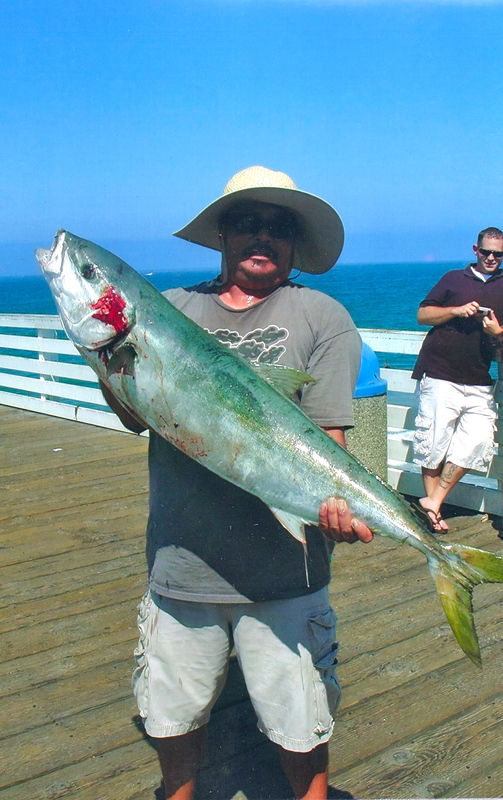 Another large yellowtail was reported as being caught in mid-September. <*}}}}}}}}}>< — If you’re visiting San Diego and need a place to rest your head I recommend staying at the Crystal Pier Hotel. It’s not the fanciest place you could stay but its unique, populated by a friendly staff, and can provide some night fishing that otherwise you couldn’t enjoy (and their motto “Sleep Over The Ocean” is appropriate). It has however also gotten a little more expensive the last few years after being “discovered” by the travel professionals/writers. Details and rates can be checked out at: www.crystalpier.com. 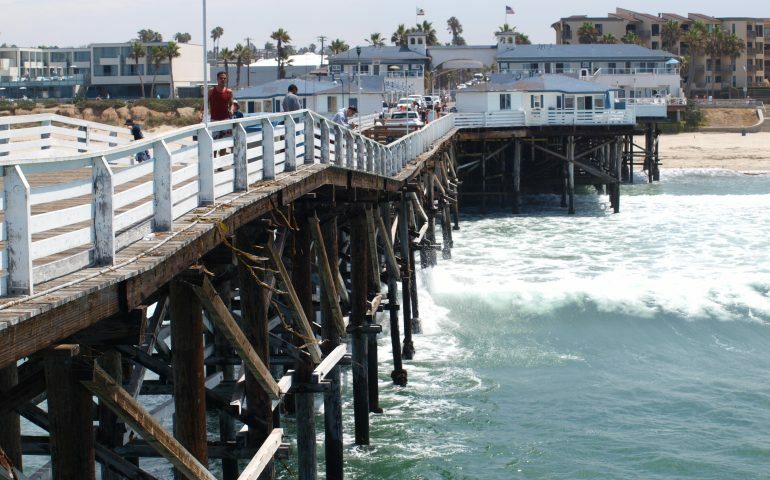 <*}}}}}}}}}>< — In 2013 the pier was named one of the top ten piers in the nation by Coastal Living Magazine. 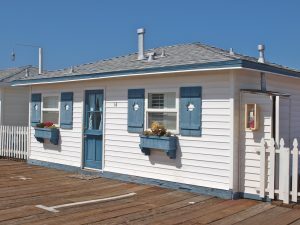 It commented: “Crystal Pier Hotel’s slogan says it all: “Sleep over the ocean.” The hotel consists of 26 pier-top cottages, most of them built in the 1930s. All have been renovated. 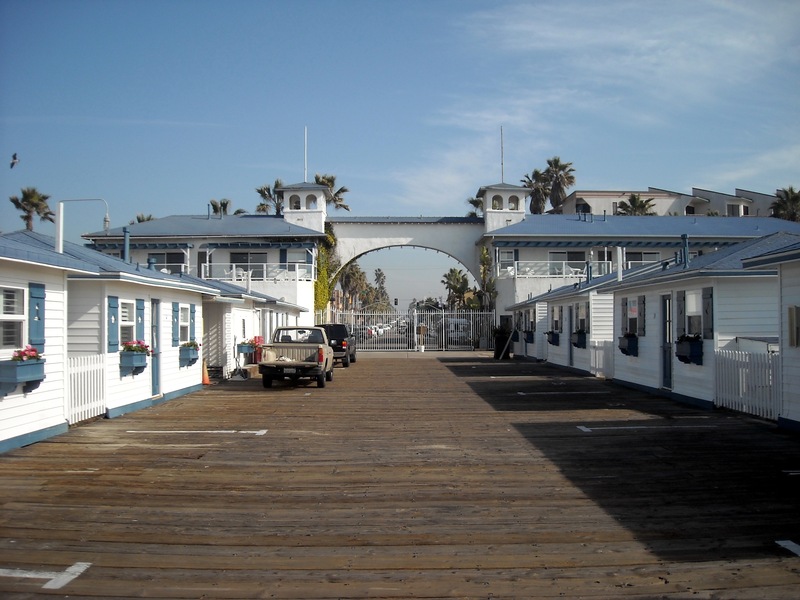 Each provides a bedroom, a living room, a kitchen, and, best of all, a patio for looking out over the magnificent Pacific Ocean.” Other California piers making the list were the Santa Monica Pier, the Santa Cruz Wharf, and Pier 7 in San Francisco. 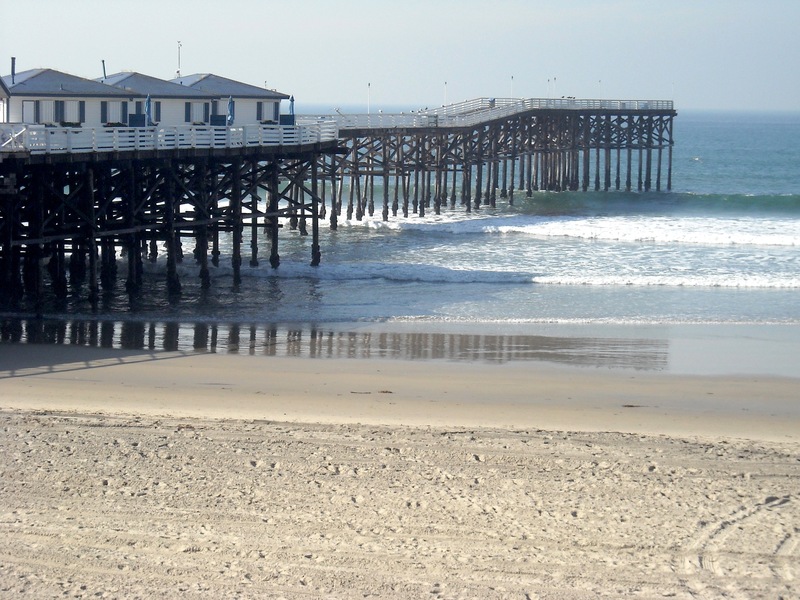 Non-California piers were: Chelsea Piers, New York, New York, Morey’s Piers, Wildwoods, New Jersey, Ocean City Pier, Ocean City, Maryland, Cocoa Beach Pier, Cocoa Beach, Florida, The Pier, St. Petersburg, Florida, and the Bell Street Pier, Seattle, Washington. My list might have been a little different but it’s still quite an honor to be named one of the top ten piers in the nation. <*}}}}}}}}}>< — For many years the front door of the Crystal Pier office had a two-sided dog bowl located next to it, one side filled with water and one side filled with doggie snacks. It was in memory of Sinjin a friendly mascot that used to greet visitors to the pier. If you look up to the right of the door you will still see a small plaque the reads: “Sinjin 7/1/91-1/10/06. Loyal companion, known by many, friend to all, faithful pier dog, a true best friend. You are family and will be missed and loved always.” Being a “dog” person myself, I know how they felt—and feel. <*}}}}}}}}}>< — An increasing number of giant (black) sea bass are being taken from the pier and though it’s illegal to pursue them or keep them, an occasional fish will be hooked. Whenever possible simply cut the line. If heavy tackle is involved and the rig needs to be removed, bring the fish up to the pier in a net, carefully remove the rigging, and return it back to the sea via the net. <*}}}}}}}}}>< — For many years two of the resident regulars were nurturing ladies who believed in giving “God’s creatures” a helping hand. They would be found most mornings out toward the end of the pier filling small buckets with their fish. Inevitably visitors to the pier would stop and look into the buckets of fish and occasionally someone would question why they needed so many fish. One or two may even have questioned if the ladies were exceeding the limits set for various species. But the ladies were catching the fish for a reason. They took their fish home and pressure-cooked them to soften the bones. Then they took the fish down to the Mission Bay Jetty where they fed the feral cats which had been dumped off by less caring members of our society. Those ladies are now gone but the memory of their good deeds linger on. <*}}}}}}}}}>< — As an ex-teacher, it’s always a pleasure to see students studying. Thus I was delighted to see a young lady sitting and studying while fishing during a visit to the pier in 2013. She obviously knew how to fish but also was studiously concentrating on her study. I finally asked what she was studying and it turned out she was a student at University of California San Diego, the same school where my son, daughter-in-law, and brother had graduated. She was studying for a biochemistry test while also trying to enjoy the warm October weather. Her name was Annika and when I asked where she had learned to fish she said she had accompanied her father on his trips to the Hermosa Beach Pier. She was a pleasant young lady and when I caught a nice-sized spotfin croaker, I asked her if she ate the fish she caught. She said she did and I offered her the fish for her dinner. I was just starting a ten-day trip to the southland and had no way to keep the fish fresh until returning home. I figured if she were like many college students she would appreciate something different for dinner, especially if it was free. She graciously accepted the fish and I offered her good luck on her exam. <*}}}}}}}}}>< — Although this fish wasn’t caught on the pier it was caught on Mission Beach which means it was very close. 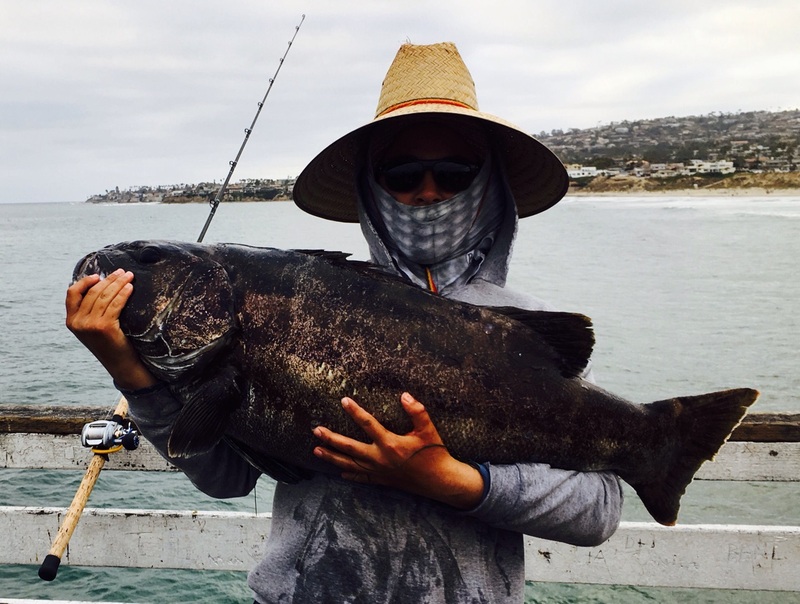 La Jolla, Marine experts say a 7-year-old boy from Santee caught a black barracudina, one of the world’s rarest fish. The only other black barracudina was a smaller one caught in 1960 off the coast of San Clemente Island, according to Dr. Carl Hubbs of the Scripps Institution of Oceanography. “Look, Mom,” Richard Baker said a month ago at Mission Beach. “I caught a fish with my hands.” Hibbs said the wiggling relative of the barracuda has since been preserved in formaldehyde. He gave Richard a book about fish in return for the foot-long fish with a long snout and large teetch. <*}}}}}}}}}>< — Some things have changed, some haven’t. Pacific Beach — Located on the coast four miles south of La Jolla and less than a mile north of Mission Bay. It was founded in 1887 as an educational center and home of the “San Diego College of Letters.” There are no buyer sheds or other special facilities but it has been a receiving point for San Diego [fishery] buyers and pickup trucks. In the past 22 years, landings have been recorded for only four years—1942, 1948, 1949, and 1950. The peak was 1942 with 39,000 pounds. The average has been 10,000 pounds per year. Nearly all of the poundage has been clams. From April through July of 1942 the landings were yellowtail, barracuda, and shark. Sport fishing is chiefly from Crystal Pier. 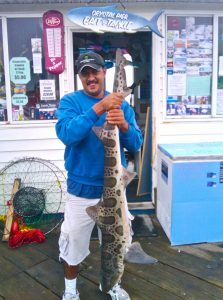 <*}}}}}}}}}>< — It’s a totally different pier—and state, but the Crystal Pier in North Carolina is somewhat famous for yielding up that state’s record blue shark. The huge fish weighed 478 lb. 0 oz. and was taken back in 1961 by Bobby Kentrolis. I’m not too sure if a blue shark has ever been taken from San Diego’s Crystal Pier although they’re certainly in the area and many California piers have seen the capture of blue sharks over the years.